It’s been raining for one week straight here in Asturias and it doesn’t seem to get any better next week. And while I don’t especially hate the rain, it’s beginning to get inconvenient. Lots of rain means floods and floods mean flooded roads and … well, I could go on and on but I don’t want you to picture me as an old fuddy-duddy. But, I’m going to be frank and tell you that the more it rains, the less I go out. No worries. This just suits me fine right now, as I have had piles of written exams to mark and a bunch of workshops to prepare. I haven’t finished. It’s Sunday and I’m still working. Anyway, work is never work when you are having fun and trying and testing new tools is fun for me. 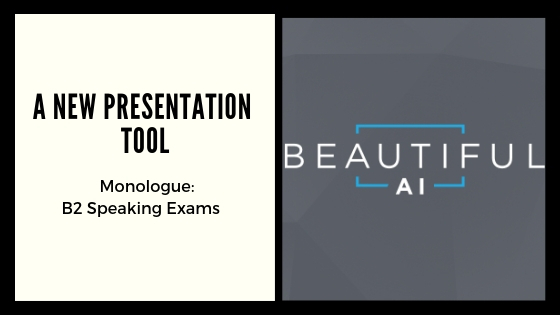 Today, I want to show a fantastic presentation tool Beautiful. Al with amazing templates which I have been using for some time now. It is a collaborative tool. You can add collaborators to your presentation and give them permissions to edit the presentation or just view it. Do you Think Translation Exercises are Boring? Just the Opposite!